Does anyone have a good cupcake recipe? Maybe--but I have some killer cupcake papers! Remember to get them from me. I usually use the box too, but I have a great cupcake book Marie gave me for Christmas you may borrow if you would like. 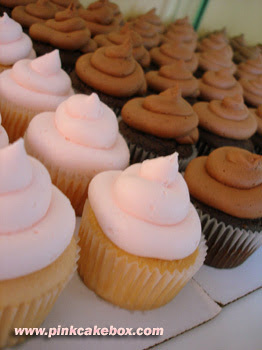 Are you looking for cupcake recipes or frosting recipes? Because I honestly think you can't go wrong with the box mix for the cupcakes. Frosting is a different story. I actually have a few books dedicated to cupcakery. Do you want to look through them? I am very intrigued by her use of nut cups as cupcake papers so that she doesn't need a cupcake pan. I have never made any of the recipes, but I have enjoyed looking at them. they look good anyway! We live a block away from the famous Dots Cupcakes and I prefer this recipe to Dots. Just sayin'. And really, does red velvet always have to be red? I think it could be pink. My mom has a cupcake book that Dan and Mia gave her from some famous cupcake bakery in NYC. I'm sure she'd let you borrow it!